This might be the album Derek Piotr has been destined to make. Long an outdoor enthusiast, Piotr often is photographed among nature, frequently in the woods, and holding items he found there. Forest People Pop, then, could be seen as a distillation of that inclination into the music he makes, a combination of the natural and the synthesized, the tangible and digital elements that Piotr holds so close to himself that they become part of him, internalized, reemerging after filtering through his imagination. 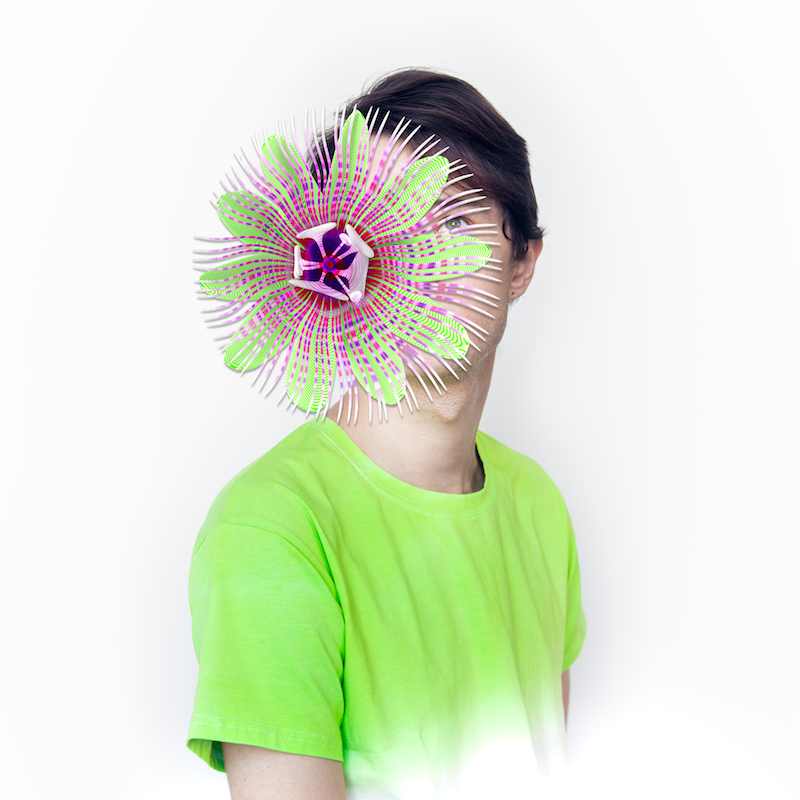 Just look at the cover art – Piotr, in green (obviously), has obscured his face with a digital representation of a flower, the medium and the result another point on the roadmap to understanding his latest album. But perhaps it’s worth noting first how refreshed Piotr sounds after his (admittedly fascinating) 2016 drone excursion, the appropriately named Drono. Whatever itch was lurking to drop beats and sing again is certainly scratched within the new material, as “pop” not only signifies a return from more outsider locales, it also actually seems to forecast the direction taken on the record. This is definitely a Derek Piotr for the masses, a delectable side presented for easy consumption. Entry into his world is not remotely difficult. The voice is Piotr’s instrument of choice and he intertwines serpentine vocal lines with electronic elements and skittering beats from beginning of Forest People Pop to its end. “Tonic/You Move” opens the album with Piotr’s vocals run through AutoTune, and trust me, AutoTune is not necessary for Piotr to thrive. What the effect does, however, is turn Piotr into what is essentially a synthesis of himself, and he manipulates the sound through Eastern chord progressions as if it were a reed instrument, almost. The result is intoxicating, a “tonic,” if you will, that slithers and undulates around the rest of the song until you’re left in a state of deep hypnosis. AutoTune will play a great role throughout the album, and it’s strange for me to say that it does not overstay its welcome. Piotr continues to charm his imagined snakes throughout, like a Pied Piper who revels in the company of the reptiles. “Light” and “Sky” are two main culprits, drifting above streets in trancelike ecstasy, completely holding the attention unwitting passersby until they see fit to release them. Piotr even plays around with footwork on “You Move/Timelapse” and “Ice Floe 2.0e,” the latter featuring guest rap vocals by Banx, a rarity (a first?) for a Derek Piotr album. Of course Banx is also run through the AutoTune ringer, and it’s an interesting side path to wander down. The album closes with two short (read: less-than-two-minute) ritual exercises, “Aquamarine Endpoint” and “Sunup,” replications of the last gasp of the previous night’s activities in the early morning. These appropriately close an album worshipping nature by indicating communal achievement within a wooded ring or clearing. This is a valiant representation of electronic music for the outdoorsperson, an oxymoron made exciting by its sheer existence.